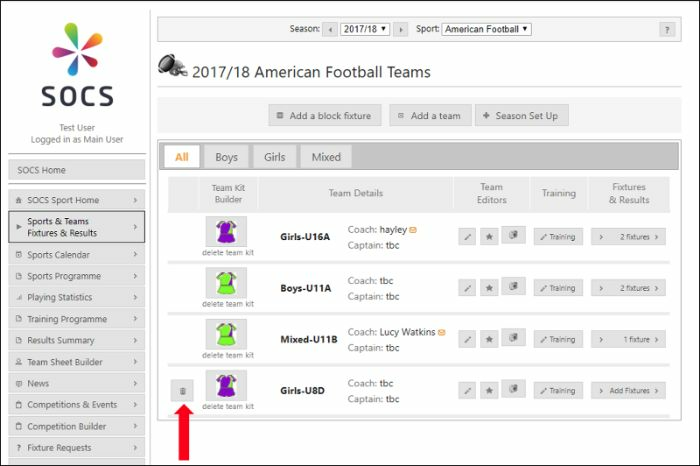 The SOCS sport content management system (CMS) recognizes when a team can be deleted and a delete button will appear automatically to the left of the team in your SOCS control panel. See the illustration below, which shows the location of the delete button. To delete a sport you must first delete all the teams. Once the teams have been deleted the sport will no longer be listed. Only teams with no fixtures, no results, no team sheets, no team photographs and no training sessions can be deleted. If the delete button is not visible and you want to delete a team then you must first delete these (if any exist). This process ensures that teams cannot be deleted accidentally. If there are competition fixtures linked to a competition microsite then these fixtures and the team cannot be deleted.